The White Elephant tied at the mouth of the Cannon. 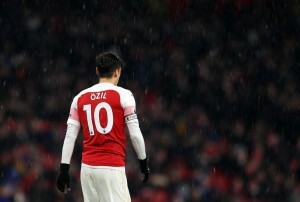 Why is Ozil no more the ‘Ozil’ we need? Egyptian Messi Liverpool FC bound? It was reported that Rodgers watched FC Basel’s in action against Schalke in the Champions League group match on Thursday. While some reports suggested that theAi? ?Liverpool manager was scouting Schalke midfielder Julian Draxler, and some said that Rodgers was watching the match to get a proper look at Schalke superkidAi? ?Max Meyer, it is now reported that the Northern Irishman was there to watch theAi??Ai? ?Swiss side’s Mohamed Salah. Mohamed Salah has been dubbed as the ‘Egyptian Messi’ and Basel are seemingly willing to sell the 21-year-old for around A?15 million. The EgyptianAi? ?can play anywhere in the front. He is also technically astute and has the pace which can scare off any defender. So far, he has scored four goals and notched up five assists in 17 league matches for Basel. Liverpool face competition from Tottenham Hotpsurs for the signature of this 21 year old as it is reported thatAi? ?Spurs sporting director Franco Baldini watched Salah against Chelsea in November. But it seems that the Merseyside club is very close to roping the Swiss League player in withAi? ?Salah’s representatives spotted at Anfield. This transfer seems to be reaching an advanced stage, provided these reports indeed are true. There probably won’t be much competition from Spurs as the Lilywhites would look for a forward add another attacking midfielder to their squad. Salah is a player who would indeed add a lot of attacking threat to the Liverpool team who are anyway ruing the lack of depth in the squad with injuries to Daniel Sturridge and captain Steven Gerrard. For a fee ofAi? ?A?15million, this looks like a good buy for the Reds and this might be the Phillipe Coutinho of this transfer window.